The e-book can be downloaded here (free), while the printed copy can be ordered online from our Lulu Bookstore here. This book was a collaboration with my Mesopartner business partners and several leading academics. This anthology brings together a large variety of articles and comments by development scholars and practitioners from all over the world. The opening article and pivot is a reprint of an influential publication on systemic competitiveness. Based on this concept, the authors are taking a look back and also ahead at various topics related to territorial development, value chain and cluster promotion, innovation and change. The reader will get a deep insight in the academic work and professional personality of Dr. Jörg Meyer-Stamer. At the same time it’s a gift for his 50th birthday. Dr. Jörg-Meyer Stamer is a pioneer in local economic development. As a researcher at the German Development Institute he co-authored the concept of systemic competitiveness and published numerous monographs and articles in academic journals. This book is an invitation to new debates in the development community. The paperback can be ordered on our Mesopartner bookstore here. I am constantly publishing reports and will only highlight some selected documents here that are frequently referred to or cited. Please contact me if you are looking for something specific of want a complete list of publications I have contributed to. CUNNINGHAM, S., WILLIAMS, G. & DE BEER, D. 2014. Advanced Manufacturing and Jobs in South Africa: An Examination of Perceptions and Trends. Conference Proceedings. International Conference on Manufacturing-Led Growth for Employment and Equality. Johannesburg: DST and Trade & Industrial Policy Strategies (TIPS). KRIEG, M. & CUNNINGHAM, S. 2014. Opportunities for the South African foundry industry in the global automotive supply chain. In Möller, H. & Curle, U.A.Conference Proceedings. AMI Light Metals 2014 Conference. Pilanesberg National Park, South Africa: Advanced Materials Research. CUNNINGHAM, S. 2013a. Comparing the priorities of private sector localisation with public sector localisation. In Localisation for Africa. [Web] [Date of access]. CUNNINGHAM, S. 2013b. Diagnosing Innovation Systems: RALIS field guide for practitioners. Mesopartner. CUNNINGHAM, S. 2013c. Insights from connecting foundries to markets and buyers. Metal Casting Conference, Kwa Maritane, South Africa. CUNNINGHAM, S. 2013d. Using Social Network Analysis methods to assess the valve manufacturing sector in South Africa. VUT. CUNNINGHAM, S. 2012a. The fundementals of innovation system promotion for development practitioners. 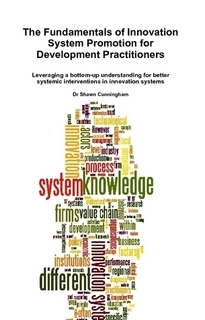 Leveraging a bottom up understanding for better systemic interventions in innovation systems. Mesopartner Monograph 5. Mesopartner. CUNNINGHAM, S. 2012b. Guidelines to strengthen Customs to Business dialogue in SADC Member States. Gaborone: Southern African Development Community (SADC) Secretariat. CUNNINGHAM, S. 2012c. Private Sector Involvement Strategy for the SADC Customs Programme. Southern African Development Community (SADC) Secretariat. CUNNINGHAM, S. 2012e. Stimulating Innovation Systems by moving from innovation to innovation systems. The Innovation Journal of the Management Today Magazine, Vol. 30,Issue 8 – 2012 Pp: 22-25. CUNNINGHAM, S. 2012f. Using Local Demand to Stimulate Innovation. Magazine Article. Localisation for Africa. Johannesburg: On the Wire Media. CUNNINGHAM, S. 2011a. Putting the Electrotechnical Sector on the South African radar screen. Johannesburg: South African Electrotechnical Support Council (SAEEC). CUNNINGHAM, S. 2011b. Understanding market failures in an economic development context. Mesopartner Monograph 4. Mesopartner. CUNNINGHAM, S., DE BEER, D. & JOOSTE, J., H. 2011. Appraisal of the innovation system in the manufacturing sector in the Vaal region Pretoria: Vaal University of Technology, GIZ and Mesopartner. CUNNINGHAM, S. & EL MOHAMADI, A. 2010. Improving the performance of sectoral innovation systems in South Africa through Technology Stations located at Universities. Reflections on the role and potential of the Tshumisano Technology Stations Programme., Pretoria: GTZ ESDS. CUNNINGHAM, S. 2009a. An appraisal of the role and potential of the TUT Technology Station in Chemicals in the innovation system. Pretoria: GTZ, Tshumisano and the Tshwane University of Technology. CUNNINGHAM, S. 2009c. Proposing a classification scheme that offers insight into the readiness of science and technology institutions to build closer relationships with industry. Gabarone: GFA and the Governance- & Reform Programme: Strengthening of the SADC Secretariat. CUNNINGHAM, S. & MEYER-STAMER, J. 2005. Planning or doing LED? Africa Insight, Vol 35(1). CUNNINGHAM, S. & MEYER-STAMER, J. 2007. Identifying Opportunities in the Downstream Chemicals Industry. Report based on the RALIS Exercise at the InnoVenton / Downstream Chemicals Pretoria: Innoventon and Tshumisano. CUNNINGHAM, S. & MEYER-STAMER, J. 2008a. Development of a cooperation framework between industry and science and technology centers in the SADC region. Discussion paper. Pretoria and Duisburg: SADC, Deutsche Gesellschaft fur Technische Zusammenarbeit (GTZ) GmbH and Mesopartner. CUNNINGHAM, S. & LAWSON, J. 2009a. Institute for Advanced Tooling: Rapid Appraisal of Local Innovation Systems (RALIS). Pretoria: GTZ, Tshumisano Trust, Tooling Association of South Africa and the National Tooling Initiative. CUNNINGHAM, S. & MEYER-STAMER, J. 2008b. Report on the RALIS Exercise in the Foundry Industry. Pretoria: GTZ ESDS, Tshumisano and University of Johannesburg. CUNNINGHAM, S., SCHOEN, C. & GODDEN, Z. 2010. Revisiting the Hexagon of LED as a framework to strengthen LED initiatives. Pretoria: Mesopartner.